A batch of sixty-one students from Heritage School set out to make new friends and engage with children from backgrounds very different from their own. Pravah, through their Adolescent Intervention program organized this fascinating and fun packed experience of community service for the students. Meeting and working with the youth and women of an NGO called ‘Aman Biradri’(The name means a ‘secular, peaceful, just and humane world’) was an opportunity like no other experienced by them! The Pravah facilitators took care to create a safe environment for the students as it was their first experience of development work. They helped the students gain a deeper understanding of communities they were reaching out to in the context of the city. Enthusiasm and creativity were keys in these initial steps that helped students transform themselves to interact with a section of society they had not been exposed to. Through this journey of understanding the diverse communities, the students were given spaces for interaction to help them understand the two different worlds. The first half on day 1 of the workshop included classroom sessions, building concepts and plenty of energizers in the open spaces. The afternoon was allotted to a community visit to enhance the understanding in connection between ‘self’ and ‘society’. 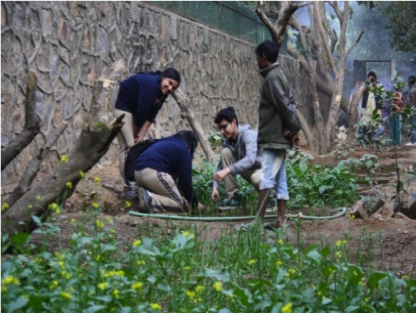 On day 2, the students performed Shramdaan under the guidance of the coordinator from Aman Biradri. They swept the playground and cleaned the kitchen garden that was lush green with wide varieties of green vegetables but filled with dry leaves and trash. The Heritage students also conducted some games with a group of children from the NGO who were between eight to fourteen years. On the final day of the workshop, the students stayed back in the Heritage school’s meditation centre to plan their action projects. Let’s dirty our hands and ‘learn differently’: Extending support to the organization. 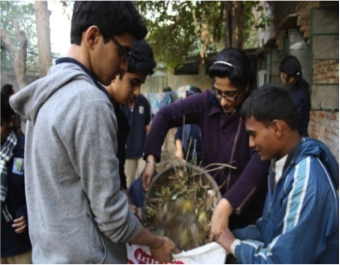 The students of Heritage school enjoyed sessions that involved practical learning like Shramdaan and interactions with the community children, rather than intense classroom based sessions. This preference reflected the experiential learning methods followed by the school for these adolescents. Not only the students, but the teachers also seemed enthused enough to be actively involved in the workshop. Their ownership and eagerness to engage encouraged the students too. Five of the teachers actively participated in the kitchen and cooked with the women from the community. This was a good space for the teachers to also engage with the outside world apart from their daily routine. The facilitators from Pravah supported these adolescents to reflect and act (Refl-Action) after the workshop. The students were encouraged to take up small action projects related to the development of society and work on them individually, in pairs or, together in groups. They planned to work on issues like the environmental conditions around their school, substance abuse among minors, providing education to underprivileged children, providing resources and financial support to budding and smaller NGOs. The overall workshop, along with the community visit helped the students broaden their horizon and analyze the importance of engaging with the world. By identifying various stakeholders within their community and understanding how the community influences them, the students were able to apply the process of refl-‘action’ in planning, designing and executing an action project. By the end of the workshop, the students were enabled to build ownership for this 5th space created by them and took up action projects to take it forward. In today’s world, where there are few secular, non-commercial spaces to “hang out”, meet others, share opinions and views and take action, there is an urgent need to create such 5th spaces where young people can lead their own development and growth. Usually, young people spend time at home with family; hang out with friends, in leisure or at college / workplace. Traditionally these four spaces make up their universe. Beyond this received wisdom they need another space which allows them to create their own understanding of the world to understand it better, to look at social issues from a systemic lens, see how they are connected to them, deal with conflicts within and around them in society and to take action that benefits all. “This workshop has opened my eyes and encouraged me to make a difference” Aaryaman Sharma, class XI. After a few months, Pravah facilitators visited the students for the workshop closure. It was heartening to see some of the action projects undertaken by the students. Some had created a blog, following the workshop to write about the impact of the exposure visit (read the blog here), others had been to an NGO, called ‘Apni Pathshala’ to volunteer by providing stationery to the underprivileged, school going children. Another group of students had taught the community children basic English, results of which were evident in the presentations made by them on the day of closure. The objective of the workshop had been fully met by the students –they had created an ocean by drops of their contributions towards the development of their society and successfully creating and sustaining the 5th space in their lives. Aman Biradri aspires to build local level institutions mainly of youth and women, of diverse faith, caste and gender, at village and district levels to strengthen mutual bonds of tolerance, fraternity, respect and peace between people of different religious groups, caste and language groups, to promote equal citizenship, justice, communal harmony, peace, and the celebration of our social and cultural diversity.